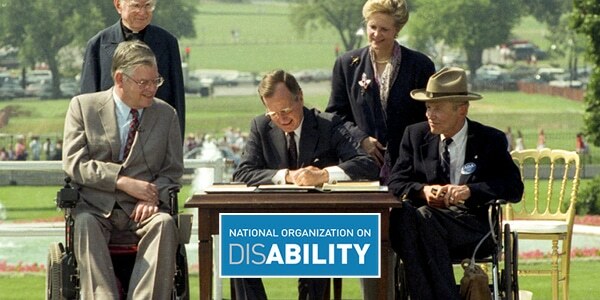 On July 26, 1990, the president of the United States looked into a television camera on the South Lawn of the White House and proclaimed that the signing of the Americans with Disabilities Act (ADA) “signals the end to the unjustified segregation and exclusion of persons with disabilities from the mainstream of American life.” Twenty-eight years later, it has not. The keystone of the American ethos is that anyone, through work ethic and perseverance, can achieve success. We believe in bootstraps and self-efficacy, beliefs that have guided public policy and formed the fabric of our culture. Here, you get what you earn. Americans with disabilities are no different. We want no special treatment, only the opportunity to work and strive for success. And while the ADA has helped close many gaps, employment is not one of them. The current labor force participation rate of working-age people with disabilities in the United States is 20 percent, compared to 69 percent for those without a disability. How do we explain this? Certainly, the ADA was a transformative policy achievement. It physically reshaped American communities by opening inaccessible spaces to people with disabilities, from office buildings to restaurants to the chambers of Congress. It built on the Civil Rights Act, making disability a protected class and giving the community recourse within our legal system. And perhaps most important, it gestured that no one should be stripped, due to a disability, of their inherent personhood and the birthrights which we hold so dear: life, liberty and the pursuit of happiness. This, the bill’s most spectacular ambition, is where it has fallen most flat. Because culture cannot be legislated, nor can full inclusion. People with disabilities have for so long been excluded from mainstream life that we, as a society, simply don’t understand them. As a result, we fall prey to the tyranny of low expectations, leading to euphemisms like special and exceptional to describe people. And although this language sounds benevolent, it is detrimental in practice. People with disabilities don’t want to be held to a different standard. We can — and want — to do the same jobs at the same levels for the same pay as anyone else; we just occasionally get there in different ways. At companies hiring people with disabilities, their performance ratings are equal to those of their peers. They help companies tap into a trillion-dollar consumer market. They are problem solvers and doers. They are assets. The ADA has removed a great number of barriers for people with disabilities, but not all steps can be bridged with ramps, and not all walls toppled with hammers. We are the carriers and arbiters of our culture, and it is upon each of us to consider the ways that we think about, talk about and interact with people with disabilities. Are we afraid of difference, or can we embrace it as strength? Because until every American is allowed to realize their full potential, none of us will. Republished from DiversityInc.com where, Carol Glazer is a regular columnist.